Pratap J is a landscape and travel photographer from Bangalore, India. He loves shooting in the great outdoors of India – a country so vast that he thinks one lifetime is not sufficient to cover the length and breadth of the country. An engineer by education and profession, Pratap J works hard to balance his hobby and day job. His weekends are almost always dedicated to photography and travel. When he is not living off a backpack, he is mentoring other photography enthusiasts in a classroom or in the field. Pratap loves to write about the places he visits in detail. He has been blogging at www.pixelshooter.net since 2006. His articles are a documentation of his experiences and also offer readers information about popular travel destinations. Combined with his stunning photography, the website is source of high quality content for travel enthusiasts. Q: How did you take to photography? How did you get into the frame? My love for photography is an extension of my love for nature and the outdoors. From when I can remember, everything about forests, mountains, streams, animals and birds fascinated me. I grew up in a big metropolitan city, so I couldn’t spend enough time venturing out into the wild. When I could afford a digital camera, I realized that it gave me a good reason to connect with nature. After I exhausted options to photograph in and around my hometown, I began to travel. I soon discovered that travel combined with photography was a great combo! Those were the days when blogging was just picking up. I jumped onto the bandwagon and started my website, www.pixelshooter.net in 2006. I intended it to be a photo-blog and a documentation of my travels. In no time I had three deep interests – travel, photography and blogging. I still continue all three to this day. Q: Is this your primary line of work? Or something you do as a special interest? Photography and travel are purely out of passion. My middle class parents toiled hard all their life to see me through good education, so I prefer not to let that go futile. In spite of the internet hype around quitting your job to follow your passion, I believe in being practical. That said, I treat photography as something sacred. It is easy to get bogged down by the mundane. Finding inspiration when you have bills to pay, deadlines to meet, and when you are stuck for long hours in traffic jams is a challenge. I have learnt that things don’t happen in life unless you make them happen. While money is a great motivation to do things in life, passion is the fuel for life. Q: Is there something about travel photography and the outdoors that fascinates you? Travel is the essence of my photography. For me, other than cities and towns, hiking in mountains and camping in forests is also travel. 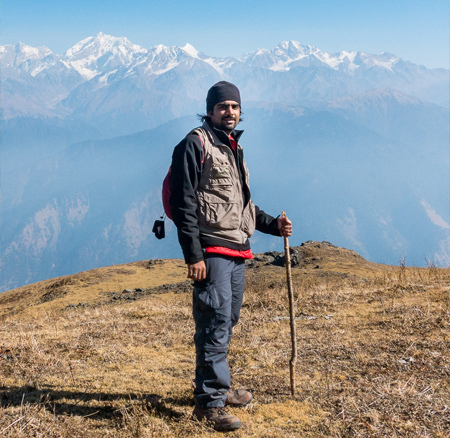 I have completed 6 high-altitude treks where I have focused on capturing the flora and fauna around me. Everything about the outdoors and nature fascinates me. We humans have mostly forgotten that we share this planet with many other creatures. Without us, the rest of the planet is doing fine by itself - it is only in places where we intrude, do we disturb the harmony of nature. I see myself as a guest when I go outdoors to these natural places. I also capture images of nature unspoilt to remind others about how beautiful our world is. So definitely for me travel and photography go hand in hand! Q: You mention the Badami travelogue on your website - can you tell us something about it? Badami was a road trip that happened with friends who share similar interests. I had previously visited Hampi a few times, so when I went to Badami, I was pleasantly surprised at how different the architecture of the Chalukya empire was. I am always humbled by the heritage of India. Our ancestors were surely a superior race and there is proof of their achievements. Sadly, in these modern times, we don’t have the time or interest to absorb this greatness. Whatever photography I did at Badami was just a small attempt to capture the grandeur which is bigger than anything we know today. Q: Also tell us about the #photographyescapade competition, for which you visited some of the tea estates in Munnar. The #PhotographyEscapade competition was held by Tata Kanan Devan Tea in 2015. I submitted some of my photographs for this competition and was pleasantly surprised when I was declared one of the winners! As part of the prize, we were flown in to Munnar and taken around the beautiful tea estates where we could all shoot to our heart’s content. The #PhotographyEscapade journey was beautifully planned and executed by Tata Kanan Devan Tea. I also got a chance to network with other likeminded photography enthusiasts who were also winners. Q: You mention mentoring photography enthusiasts at the Darter Waterfalls – can you share this experience with us? I conduct The Waterfalls Tour for Darter Photography, a travel agency focused on wildlife, cultural and outdoor photography. The tour happens every year after the monsoons and I lead a group of photography enthusiast to some little-known places in the Western Ghats, where we practice techniques to shoot flowing water. Our participants on the tour invariably end up falling in love with the natural beauty of the places we visit. And since we have handpicked spots that are not on the tourist map, they get a chance to spend quality time on the field learning the nuances of photography. Q: Timeshare comes close to some of the wonderful experiences you have described – have you been to a timeshare location on a vacation? Yes, I have indeed heard of timeshare in India. Although I have not been to a timeshare location, I think it is a great annual vacation platform. Holidaying together is a great way for a family to bond. Young children who are exposed to the vastness of this world grow up to have a better understanding of life. When a family invests in timeshare, there can be no excuses for not taking time out from busy schedules. We are lucky to live in a country that has a variety of travel destinations. A holiday in the hills, a weekend by the beach, a visit to a desert, or a jungle safari – we have it all and more in India. So a timeshare definitely makes sense for families!